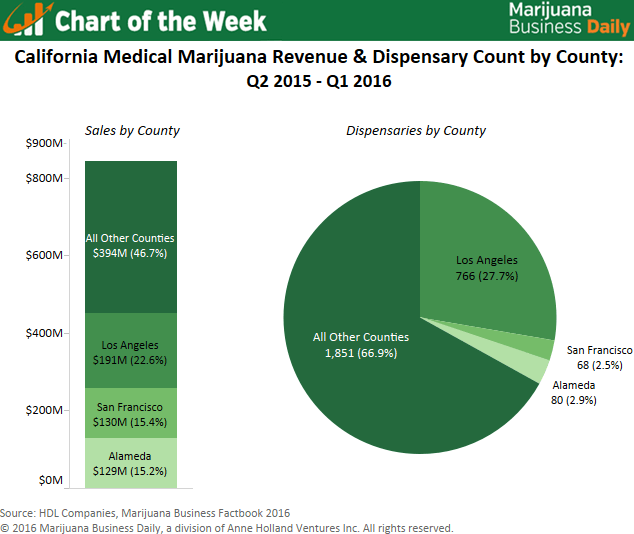 This is the second in a series of charts featuring data on California’s medical cannabis market. Marijuana Business Daily will publish additional charts in this series every other Monday until mid-November. The first chart is here. Over half of all reported medical marijuana sales in California’s massive $845 million MMJ market are concentrated in just three counties in the state, according to exclusive data obtained by Marijuana Business Daily. The counties – Los Angeles, San Francisco and Alameda – totaled $450 million in medical marijuana sales over a one-year period ending in March 2016, accounting for 53% of all reported MMJ sales in the state during that time. More than 900 dispensaries are operating in the counties, representing 33% of all MMJ storefronts in California. Marijuana Business Daily obtained the numbers via a partnership with HDL Companies, which contracts directly with nearly every county throughout the state to analyze sales tax receipts from businesses. Actual sales numbers are likely bigger, but the unregulated nature of California’s MMJ market has left many dispensaries operating in legal gray areas – avoiding further taxation and regulatory scrutiny by under-reporting their sales. The figures offer a detailed look into California’s opaque MMJ market, highlighting areas where the industry has a strong foothold and offering insight into the cities and counties primed for growth once comprehensive regulatory reform – and possibly recreational legalization – is implemented in the near future. The three counties with the highest sales are home to some of California’s biggest cities, including Los Angeles, San Francisco, Oakland, Berkeley and Long Beach. Of those counties, Los Angeles is the true heavyweight. Los Angeles County – the most populous region in California – posted $191 million in dispensary sales over the recent 12-month period, the highest by far of any county. It’s also home to 766 dispensaries, absolutely dwarfing all other counties in the state. In fact, there are more dispensaries in Los Angeles County than in Colorado, Arizona, Illinois and Nevada combined. San Francisco County, which consists of only the city of San Francisco, recorded about $130 million in dispensary sales across 68 dispensaries. Alameda County – just across the bay from San Francisco – logged $129 million in sales from 80 dispensaries. Additional counties in California that recorded more than $30 million in annual sales included Sacramento, Santa Clara, Sonoma and Santa Cruz. With average dispensary sales above $1.5 million in San Francisco and Alameda counties, the numbers suggest that cannabis businesses in those areas are much more productive than those in Los Angeles County. And while this is almost certainly true, it’s not due to a lack of demand for MMJ in Los Angeles County. Rather, it’s a reflection of the MMJ regulatory landscape – or lack thereof – in Los Angeles County. Unlicensed dispensaries have continued to operate throughout the county, under-reporting sales to collect a larger share of revenue and avoiding detection by county officials. Conversely, San Francisco has a robust program by which the county can permit, regulate and inspect MMJ dispensaries, providing clear direction and incentive for MMJ businesses to operate in full compliance with the law. The data suggests that impending regulatory reform – passed in 2015 and slated for implementation in 2018 – will have a profound impact on California’s MMJ market. Dense, urban areas of the state like Los Angeles and San Diego, where a large number of dispensaries operating in spite of the law are meeting MMJ demand, will likely be driven out by market forces – replaced by licensed, professionally-operated businesses. 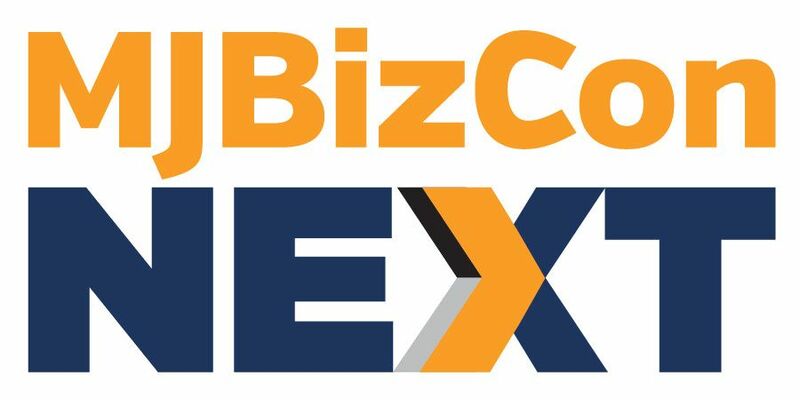 Business owners eyeing an entrance into California’s market should be aware of the unique dynamics of each local market, paying close attention to how looming regulation will affect commercial opportunities. How can LA county only generate 191 million in sales with 766 dispensaries and SF generate 130 million with only 68 dispensaries? Seems like the prices in SF must be a lot higher. This is quite a difference. Can the data explain this discrepancy? OK, read the full article and now have answered my own question, thanks.